Sunday morning worship settings at Bethany Lutheran Church are traditional in design. Parishioners are led in worship as they participate in the liturgy of the Lutheran Book of Worship. Two identical worship services are scheduled on Sundays at 8:00 am and 11:00 am with Christian education classes conducted from 9:30 am to 10:45 am. Holy Communion is served during the 8:00 am worship service on the 1st and 3rd Sundays of the month and during the 11:00 am worship service on the 2nd and 4th Sundays. 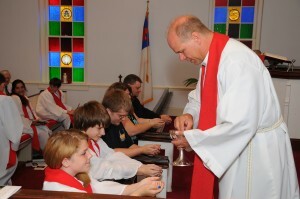 Also, Holy Communion is served during both worship services on the 5th Sunday of the month. You can fill out our contact form below to submit a Prayer Request. ©2019 Bethany Lutheran Church. All Rights Reserved.